Almayer's Folly was one of Conrad's earliest attempts to write in English, his adopted language. 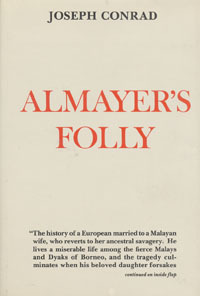 In the story of Almayer, a Dutch trader living in the Malaysian jungles with his native wife and daughter, Conrad first employed the themes and setting that characterized much of his later fiction. The conflict of Western and Oriental cultures, the power of nature, and the effects of cowardice and racism are all essential aspects of this troubling story. And in Almayer Conrad created one of his most memorable doomed heroes.